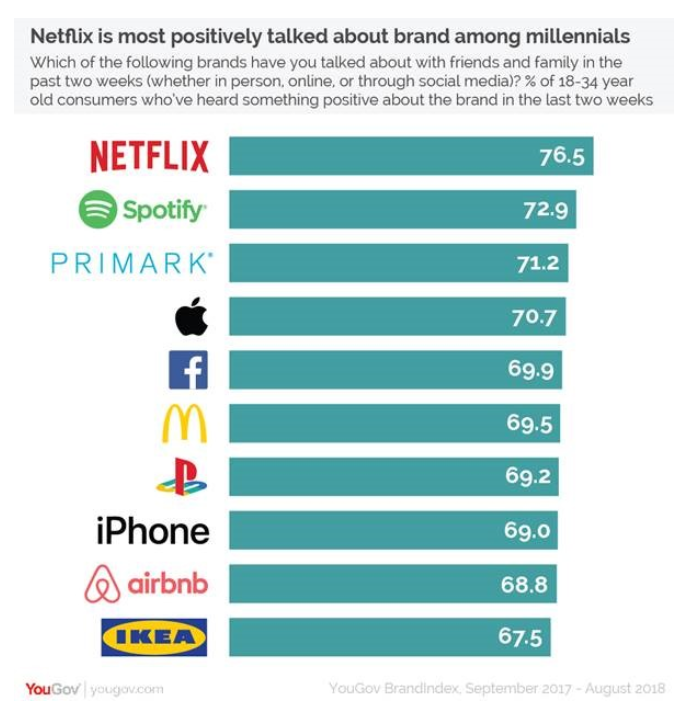 Netflix was the most positively talked about brand among UK millennials for the second year in a row, according to new research by YouGov. The subscription video-on-demand service ranked higher than second-place Spotify, third-place Primark, fourth-place Apple and fifth-place Facebook, in a top-10 that was dominated by tech firms. In total, 77% of the 18-34 year-olds polled in the study said they had talked in favourable terms about Netflix with family and friends in the past two weeks, compared to 73% for Spotify. “By its very nature Netflix’s content invites discussion, and YouGov’s rankings show that the brand has certainly harnessed the power of word of mouth recommendations to gain a loyal following among a younger generation of viewers,” according to the report. 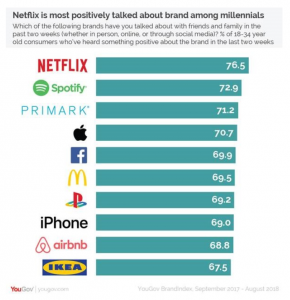 The other brands on the list, from fifth to tenth, were McDonlad’s, PlayStation, Apple iPhone, AirBnB and Ikea – with PlayStation, iPhone and Airbnb all sharing a joint score of 69%.